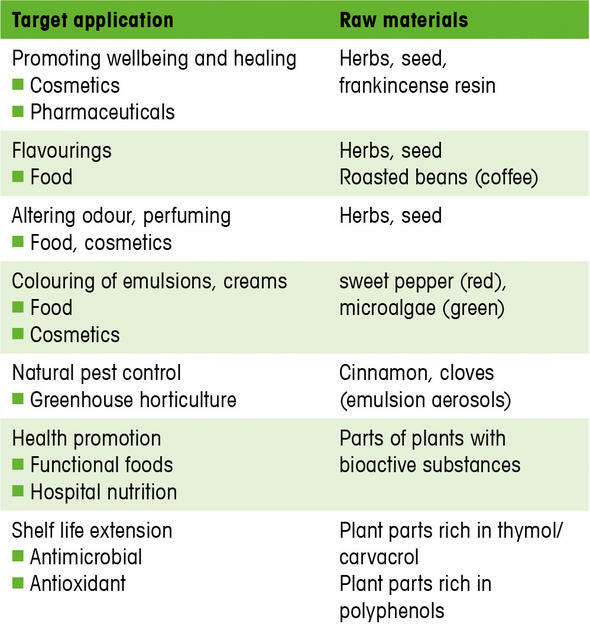 The isolation of bioactive plant ingredients, essential oils or dyes and flavourings of plant origin requires costly and sophisticated procedures. Several applications do not actually require isolation of the individual components, however – their concentration is sufficient. Moreover, for ingredients that add flavour or perfume, it’s also beneficial if the profile of the constituents involved remains as little changed as possible. This also applies to health-promoting qualities and other effects. The following example shows that the concentration or extraction of plant-derived ingredients can be significantly accelerated and simplified if this is combined with seed pressing used to harvest vegetable oils. 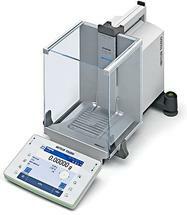 Suitable rapid methods are currently lacking for process monitoring or on-site quality control of the extraction product, however: for certain ingredients, sophisticated analysis is required to determine extract content. Here, rapid process support methods are not yet available. 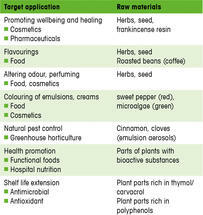 For the isolation of bioactive or other valuable plantderived ingredients, sophisticated and specialised procedures are applied: of particular importance are extraction techniques using polar or non-polar solvents. The following steps for purification or concentration can be used to standardise the ingredients and ensure quality parameters are met. For isolated perfume and flavour components in particular (essential oils), the primary concern is to perform extraction with great care, so as to ensure the natural flavour or perfume profile is not altered by external influences. This also applies to ingredients having a specific biological activity. Although easily dosed, these extracts or essential oils have the disadvantage of a high price and (for some) classification as hazardous substances. For a wide range of applications, extracts with a broader spectrum of ingredients and a lower concentration of substances can be used, instead of highly concentrated individual components (such as those beneficial to health or healing, or perfumes and flavours). Accordingly, less costly procedures can be used for their harvesting. One such technique is ingredient extraction from dried parts of plants using virgin vegetable oils. in a specific ratio (figs. 1a and 1b) and briefly subjected to high pressure in the screw press (fig. 2) . The oil extracted in the same press – itself containing the virgin and variously polar phospholipid spectrum – gently extracts the hydrophilic/hydrophobic water-(in)soluble ingredients from the plant material. 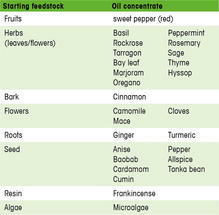 This method extracts the plant part ingredients while simultaneously concentrating them in plant oil (see tab. 1). The oils obtained by the process are stored in dark bottles after filtration. 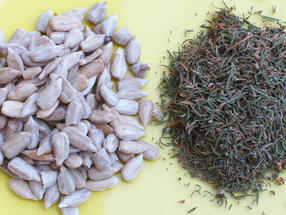 the extract-enriched oil with the natural perfume of herbs and spices (e.g. 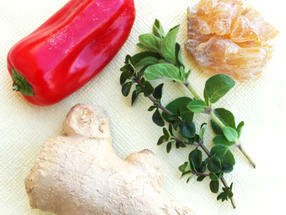 anise, cinnamon, cloves, basil, oregano, thyme, lavender, etc. ): the oil proves to be an exceptionally good match in many respects. This even applies to the red colour of salad bell peppers or the green hue of microalgae. Such enriched oils (oil concentrates) are easily miscible with other oils or liquid fats; direct use is possible without needing to observe laws on hazardous materials. Detailed investigations have been carried out to determine the effectiveness of the SPE method with oregano and basil. 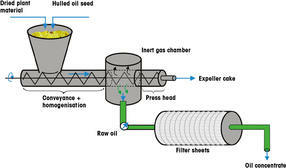 In this work, oil concentrates were pressed from herb varieties with varying essential oil content and at various dried herb to oil seed ratios; the accompanying chemical research work was performed at Anhalt University of Applied Sciences (Bernburg, Germany) . The results indicated which raw material ratio produced the best oil yield and how the proportion of essential oils in the raw material affected the proportions in the oil concentrate. 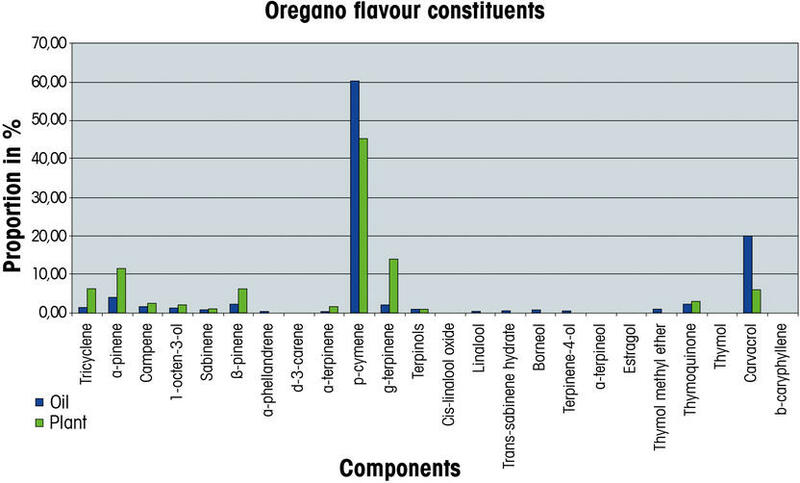 Figure 3 presents an example of the proportions of various flavour components in dried oregano and in an oregano oil concentrate produced by a 3:1 mixture (hulled oil seed:herb). The results estimate the proportion of essential oil in the oil concentrate at 1/3 of the proportion in the dried herb (diluted 1:3 by the oil seed/herb mixture). 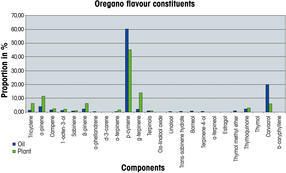 Table 3 gives details of the methodology used to characterise the concentrated oregano ingredients in sunflower oil. 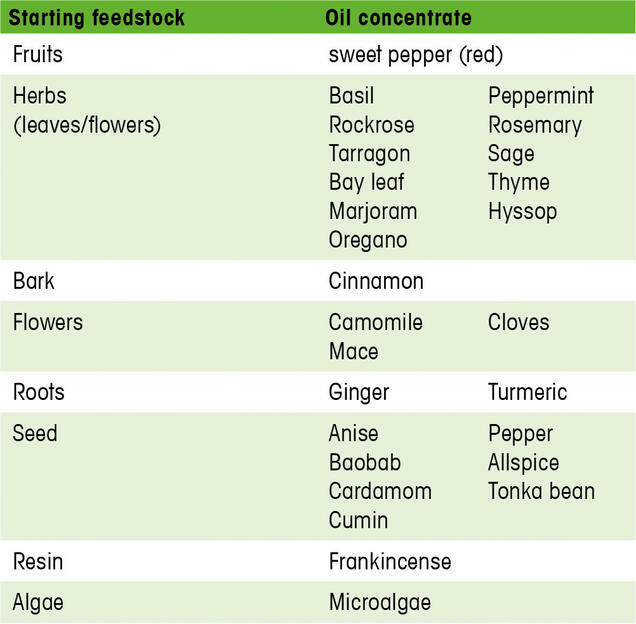 This table also gives further examples that underline the effectiveness of the SPE method for the concentration of plant oils with a range of separate ingredients. With the exception of plant-derived dyes, for which spectrometry methods could be deployed for process control, the degree of subsequent investigative effort required to confirm extraction results is high, and demands a creative approach to simplifying ingredient detection and identification. 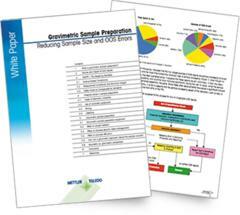 Sophisticated techniques (distillation, GC/MS and HPLC/MS) have been applied to confirm the suitability of the SPE method for concentrating plant oils with certain plant-derived ingredients. While these methods deliver precise figures, they are time-consuming and require a correspondingly higher level of investment. 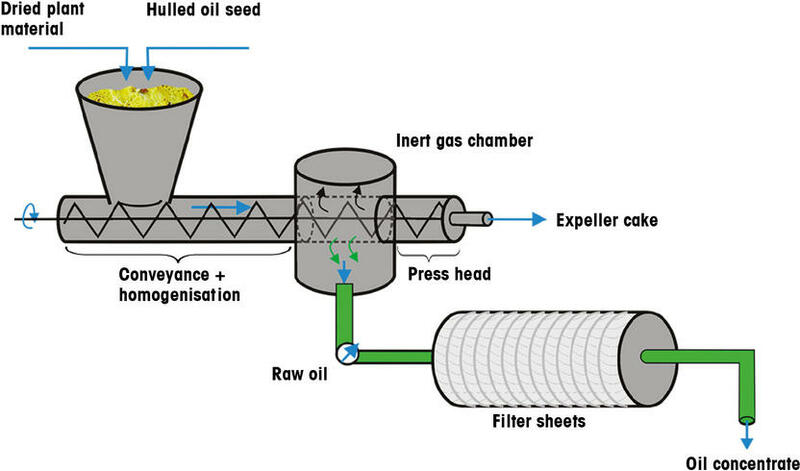 As of this writing, there are no suitable rapid methods (such as NIR) capable of providing clear results that could be used to further optimise the oil seed/plant material ratios and local SPE methods. This gives rise to a number of interesting research tasks, whose solutions present an interdisciplinary challenge. First publication: Muschiolik, G., q&more, 2.2014.